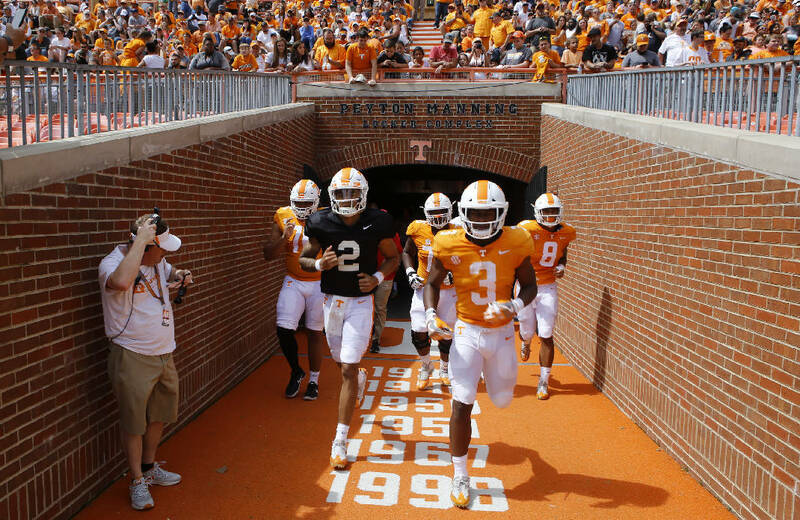 Orange team quarterback Jarrett Guarantano (2) and running back Ty Chandler (3) take the field after halftime of the Orange and White spring game at Neyland Stadium on Saturday, April 21, 2018 in Knoxville, Tenn.
KNOXVILLE — The Southeastern Conference's sports information directors have handed out one of the most scathing preseason indictments yet of Tennessee's 2018 football team. Polled by AL.com, SEC East SIDs predicted the Volunteers will finish last in the division under first-year head coach Jeremy Pruitt this season. Tennessee faces a conference slate that is arguably the toughest of any team in the SEC East because of its two cross-division opponents. The Vols will play at 2017 SEC West champion Auburn and host Alabama, last season's national champion, in back-to-back weeks during October. The brutal schedule comes as the Vols attempt to put the program's first eight-loss season behind them with the help of a completely overhauled coaching staff and a depth chart that still has many questions. As Pruitt noted in a radio interview with "The Swain Event" this week, his first team in Knoxville includes a lot of "unknowns." But the summer projections have not been all bad for Tennessee. The unknowns appeared to have spurred some measured optimism among other pundits, including SEC Network analyst Tony Barnhart, who predicted last month that the Vols will finish fourth in the SEC East with a 4-4 league record. Street & Smith's college football preview magazine shared Barnhart's optimism, projecting Tennessee will finish fourth in the East and play in the Music City Bowl, while preview magazines from Athlon and Lindy's predicted a sixth-place finish. The three publications and Barnhart all agreed on at least one thing by predicting Vanderbilt will finish last in the division. The SEC East SIDs projected a sixth-place finish for the Commodores. Pruitt is not concerning himself with projections made by those outside the program. When pressed about the expectations for Tennessee in 2018 this offseason, he has focused on the style of play he wants to see from his team. "In this league, nothing is easy," Pruitt told "The Erik Ainge Show" this week. "There are going to be times that we're in a game and we may be up three touchdowns, and there may be times we're down three touchdowns. So it's going to be important how we think, because the scoreboard shouldn't change the way we play." Asked during his appearance on "The Swain Event" about what he wants fans and opponents to say after facing the Vols this season, Pruitt replied, "I want them to say these guys never quit." "To me, we get judged on wins and losses — I get that," Pruitt said. "But there's going to be lots of nights people are probably going to walk out of Neyland Stadium and we probably won a football game, and I'm going to be home and I'm going to be ticked off because I'm not satisfied with the way we played. There's a standard we want to play with, and we've got to get our guys to do that all the time."